Welcome to National University Degree Admission 2018. 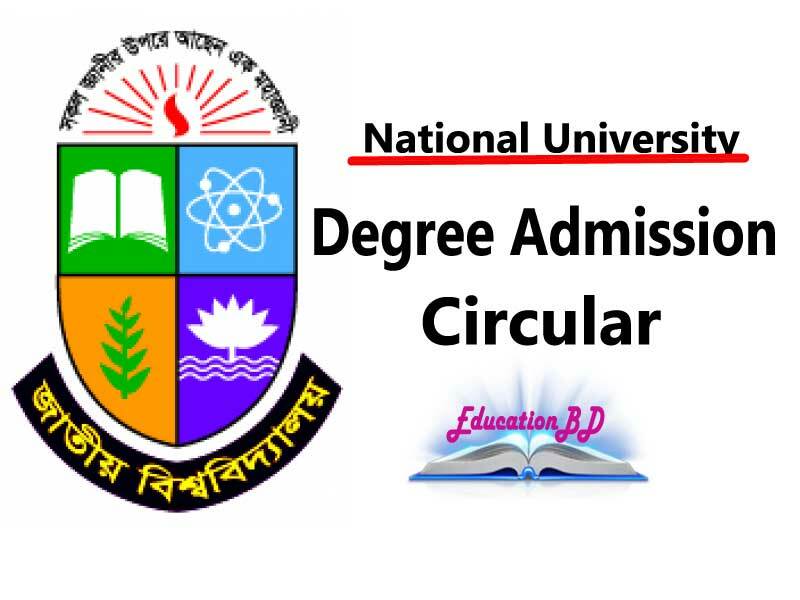 The National University of Bangladesh recently published Admission circular for degree pass course students to the session 2018-19. 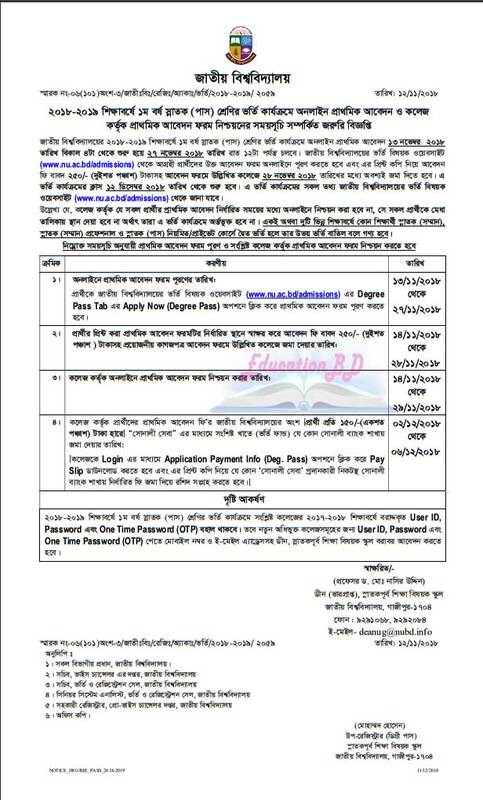 This admission notice is only for the students who want to admit degree course under National University Bangladesh. National University Degree Admission 2018 notice published NU official website as well as our website Educationbd. Nu is the first platform for rural and poor students. This degree admission 2018 is applicable only for the students who could not admit honours admission 2018. National University Degree Admission 2018 published a few days ago. 1st year of National University’s 2018 academic year, primary online application in the admission process of the graduate (pass) class, 13 November 2018 and the date starts at 4 pm and ends on November 27, 018 at 12 pm. Candidates interested in National University degree admission related websites will be required to apply for the application form online. The admission program will start from December 12, 2018. All the information about the admission process will be known from the National University admission website. It is to note that the candidates who do not have to be certified online in the prescribed time for the initial candidates of the college will not place in the merit list, i.e. they will not be included in this admission process. In the same or 2 different academic years, if any student graduate (Honours), Bachelor (Honours) Professional and Bachelor (Pass) Dual admission in regular/private courses, both entries will consider canceling. Generally, Degree Admission 2018 process of NU will 13th November 2018 and it will continue to 27 November 2018. All the Admission system of Degree will online. To apply for your admission you have to use the online system. 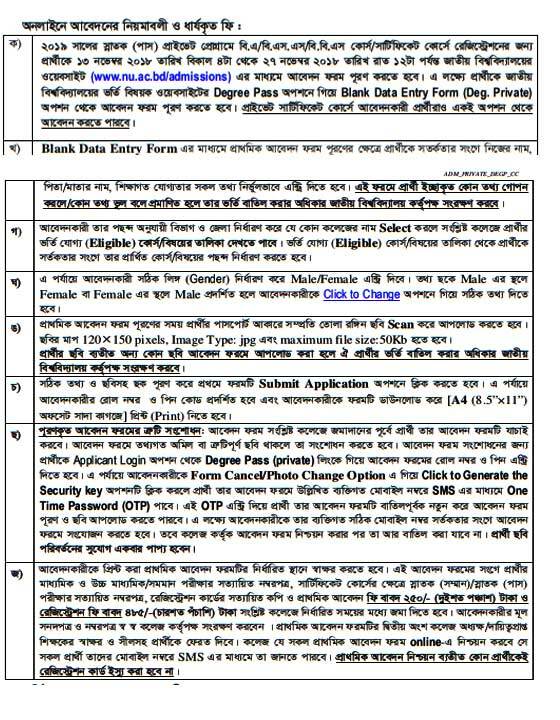 Degree admission circular 2018 all is here. You will get all the information like how to apply, application fees and others. It is the most important circular for all types of students. Everything about degree admission and result here. This is the official notice for the degree students. The circular started from 13 November 2018. It will end 27th November 2018. We are now providing information on how to apply for degree pass admission. The instructors can apply in 6 courses at the degree admission. For this three-year course, you will have to be admitted to the undergraduate college of the National University of Obstacles. We are now showing 6 topics of Degree admission 2018. Candidates who have passed the Bachelor (Pass) / Bachelor (Honors) examination from any recognized university in Bangladesh, without any of the subjects as mentioned earlier, who have passed the degree (pass) / graduation (Honours) examination, about any one of the following mentioned in the certificate course. Can apply for Degree admission 2018. Candidates who register with the certificate course will be able to participate in the Certificate Course Examination by the same class and curriculum along with the graduate (pass) private candidates in the year 2019. Applicants for registration for BA / BSS / BBS course/certificate course in the graduate program of graduate (pass) in the 019th November, 13th November, from 4 pm to 27th November, 018 till 12 pm on the National University website. The form must be filled. You will get a blank document and After that fill the form by your information. If the applicant determines the name of any college according to his/her choice, then the list of eligible courses/subjects for the candidate can be found in the concerned college. 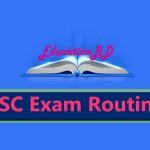 Candidate must carefully select his / her choice of course/topic from the list of eligible candidates. Select Male Or Female According to your Gender. Print The Whole document and Submit you desire college. The applicant must sign the initial application form printed in the designated place. With this application form, the certified number of candidates for secondary and higher secondary / equivalent examinations, certified letter of graduation (honours) / graduate (pass) examination, approved copy of registration card and 250 / – (two hundred fifty) and registration fee for registration fee 485 / – (four hundred forty-five) costs will be deposited in the concerned college within the stipulated time. In the same institution/college, the results of two or more applicants in the same course are the same, all these applicants. In the direction, of course, the SSC and HSC of GPA in the SSC and HSC examination with 4th subject respectively, 40% and 60% respectively). If the two or more application will same then The person who is young will give priority. Degree Admission Result 2018-19 will publish after the 2-3 week after online application. Students need to wait for their desired results. After the results of admission, the merit list will publish through the merit list; the second merit list will issue with zero seats. After the admission of the first merit list, the National University will provide a second merit list. After the admission of the second merit list, the first release slip will give by the National University. The quota result will publish by the National University.